The Mazu March Mania, held around the birthday of Mazu after the Chinese Lunar New Year, has been hailed as one of the top three religious and cultural events around the world. In celebration of this festive occasion, TCO will hold Holy Pilgrimage, the opening concert of the 2016 Taipei Traditional Arts Festival, on March 26th. The concert, which marks the most significant event for TCO in the first half of 2016, will feature Caprice of Mazu's Patrol by Zhu Yun-Song and The Mazu Incense Praise Lyrics by Huang Ying and Composed by Gu Guanren, the latter being a large-scale work for four solo vocalists, a choir, and a Chinese orchestra. The concert will also present Symphony Evolution, a four-movement piece commissioned to young composer Wang I-Yu for this concert. In the past, large-scale works with multiple movements for traditional Chinese music were a rarity, not to mention works that combined vocal elements and used a choir. Among the handful of works, The Mazu Incense Praise by Gu Guanren is considered one of the most representative. “If an orchestra can work with vocalists more often, the timbre of the orchestra will be greatly enhanced and enriched,” said the composer. Symphonies are much rarer in the Chinese music repertoire, making Symphony Evolution a much anticipated work in the program. “I think that the timing is right at the moment in terms of the caliber of the orchestra or meeting the expectations from the audience. TCO should make every endeavor to introduce more large-scale works of Chinese music down the road,” said Wang I-Yu, who is one of the most promising Taiwanese composers of the new generation. Themed as "Stepping through Time and Space— A Journey between the Present and the Past", the 2016 Taipei Traditional Arts Festival seeks to transcend the boundary between time and space with traditional arts and infuse creative elements into traditional Chinese music. 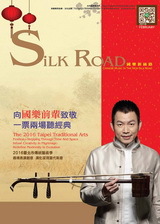 This year’s program, with 12 self-productions and 11 external productions, covers a wide spectrum of genres, from music, traditional theatrical performances (Taiwanese opera, traditional Hakka theater, and Taiwanese hand puppet theater), to vocal arts, making the series of events a feast for the senses.